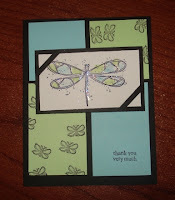 Here's a card I received from my good friend Sarah Safar from Cambridge, using that cutie-patootie "Polka Dots & Paisley" set from the Spring mini catty. 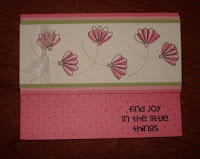 I love how the top flap of the card opens up -- that's adorable! Another great card from Jennifer Tinline (my fellow Founders Circle chickita), and I just love how the Dazzling Diamonds really perks up this great colour-blocked creation! 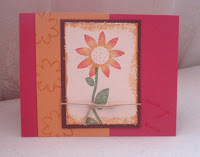 Let's see... here's one from Karen Motz and I'm going to be CASEing it for sure at the next retiring 10 Card camp I'll have -- fast, fun and fabulous! I am seriously going to miss "Petal Prints" when it retires, it's one of my fave floral sets. 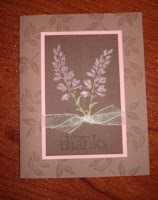 Last but not least was a card from Alicia Ryckman -- isn't it purdy???? If you're stopping by my studio anytime soon, I'll have these cards up on display so you can see them better in person. Speaking of the studio, I think I'll have the last of the moving/re-org done by 2 weekends from now, just in time for my end of month events. Depending on how well my taxes are going, it might be sooner but I doubt it. I think my accountant will be spanking me this year for getting everything to him so close to Revenus Canada's filing deadline (eek! )- my bad.